The December solstice is this Tuesday, December 22. To the astronomically inclined, it is a precise moment at which the sun appears to cross the equator, or something like that. If you're into that sort of thing, there's a terrific explanation with lots of photos and graphics at Earthsky.org you can peruse. Enjoy! For those more philosophically inclined, it's the time of year when the sun seems to stand still. I love that, because it is both lovely and a bit ironic, considering how much people are running around at this time of year, trying to get all their holiday preparations in order before Christmas. It can be hard to let go of the busy-ness and give ourselves permission to pause, whether to ponder the holiness of a sacred birth, or to just sit with the stillness and beauty of the winter solstice. Sometimes an evocative object can be just the thing to help us slow down and ponder that which is truly important to us. 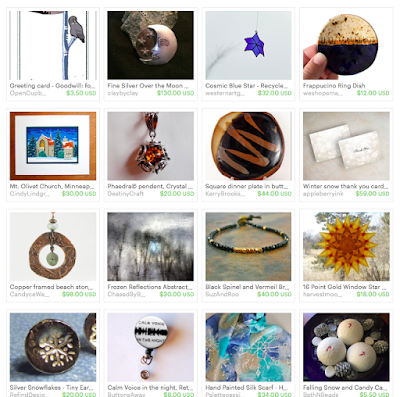 I selected the items in this collection, a treasury on Etsy of handmade items from Minnesota, for just that reason. Forget your gift list and to-do list for a moment, and consider whether one of these objects might be just what you need to help you remember to be still with the sun on a winter's day.